Apart from Narayanswami Srinivasan, it was learnt that another former BCCI president who is currently out of favour, was also frantically calling state units and advising them against forming a committee for implementing the Supreme Court-appointed Lodha panel reforms. The Board of Control for Cricket in India's decision to form a committee for implementing the Lodha Panel reforms was specifically done to foil former president Narayanswami Srinivasan's attempts to maintain 'status quo' in the Board after he rejected the adoption of a resolution at the Special General Meeting in Mumbai on Monday. Apart from Srinivasan, it was learnt that another former BCCI president who is currently out of favour, was also frantically calling state units and advising them against forming a committee for implementing the Supreme Court-appointed Lodha panel reforms. It was an action-packed last 24 hours in Mumbai where it was learnt that the former BCCI supremo had initially agreed upon that a resolution be adopted on implementing most of the Lodha reforms. Accordingly, the president of a state unit from west zone, who is also a senior lawyer, prepared a resolution. However, in the morning, the Tamil Nadu strongman did a U-turn and said that he is not agreeable to any resolution being adopted at the Special General Meeting. "It was surprising as Srinivasan on Sunday evening said that he is game if a resolution is adopted, which also mentions the contentious issues (like one state one vote, age cap of 70 years, cooling off period of three years and five member selection panel instead of three). But today morning, he went back and said he will not support any resolution," a senior state unit official present at SGM told PTI. "Srinivasan and his followers felt that let Supreme Court decide and BCCI should not implement any reforms. But that also met resistance." A majority of the state units wanted to break the impasse but a few like Srinivasan wants the status quo to be maintained as it would further delay proceedings. Interestingly, two former office-bearers including a president and a secretary were also calling up units to stop them from forming a committee. 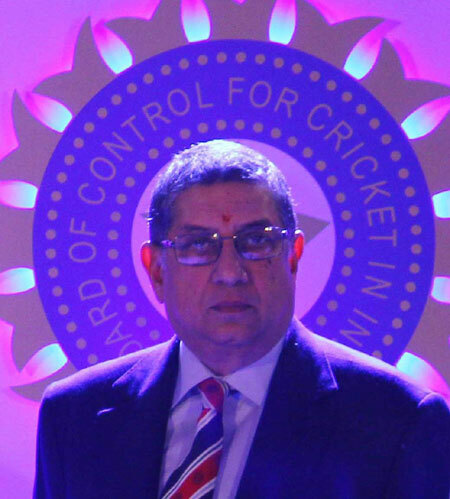 "This former BCCI president like Srinivasan was dead against formation of a committee. He called up a lot of units to gather support but members finally felt that we need to take some timebound action," the source said. The confirmed committee members are acting president C K Khanna, acting secretary Amitabh Chaudhary, treasurer Aniruddh Chaudhary and a representative of northeastern states. A couple of more members are expected to be a part of the committee. Srinivasan attended the BCCI's Special General Meeting in Mumbai as a representative of the Tamil Nadu Cricket Association. "Where are you from, which channel?" Srinivasan questioned a scribe when he was asked in what capacity did he attend the SGM. To which, a visibly angry Srinivasan responded, "I congratulate you, you just now made me shut up". When the scribe again asked the same question, the former International Cricket Council chief said, "Better right (capacity) than you have to ask me". Celebration time for the man who dared take on Srinivasan and the BCCI!